The Church of Rome officially calls its Eucharist, “the source and summit of the Christian life.” Its International Eucharistic Congress is therefore of utmost importance to the Vatican. Rome also states that, “the Eucharist is the sum and summary of our faith.” Therefore, an examination of the Catholic doctrine of the Eucharist is essential to reveal the heart of the Vatican. This we have done in the article below. 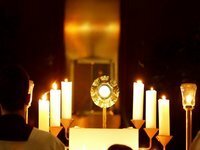 We are conscious of the fact that adoration of the Eucharist is a most sensitive topic to Catholics. Thus, our analysis is carefully done, and I ask that in using the article you will likewise exercise great care. Please study the article, and forward it to those you know. Thus has the Papacy proclaimed that its Eucharist under the form of bread contains the Lord’s identical body, soul and deity. They claim all of the bread, except the appearances, is transformed into Christ in His Godhead, and in His manhood with all its component parts: soul, body, blood, bones, flesh, nerves, muscles, veins, and sinews. What a horrific insult this notion is—for it both ridicules Jesus Christ the Lord and deceives people, defrauding them of the truth. Our Lord spoke about such a blasphemy as this when He forewarned, “if any man shall say to you, lo, here is Christ; or, lo, he is there; believe him not.”4 In contrast to the Catholic teaching, the truth is declared in the Scriptures, “This same Jesus, which is taken up from you into heaven, shall so come in like manner as ye have seen him go into heaven.”5 There is a day appointed in which the Lord will physically return in like manner to His ascension. One must not expect Him to return until that appointed day when “he will descend from heaven with a shout, with the voice of the archangel, and with the trump of God.”6 Consequently, to propose that the glorious Lord Jesus Christ has come back to earth in the lifeless form of bread is an attempt to replace the preaching of the biblical Gospel with a mere physical connection to a Roman Catholic sacrament. 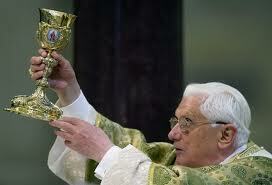 Persistently the Church of Rome asserts as fact its dogma that Christ is actually present in its sacrament. For example, it states, “It is by the conversion of the bread and wine into Christ’s body and blood that Christ becomes present in this sacrament.”7 This dogma is necessary to support another unbiblical premise, “Life in Christ has its foundation in the Eucharistic banquet.” The proof text they use is, “As the living Father sent me, and I live because of the Father, so he who eats me will live because of me (John 6:57).”8 According to Catholic teaching, “The principal fruit of receiving the Eucharist in Holy Communion is an intimate union with Christ Jesus.” The proof text attached to their reasoning is, “He who eats my flesh and drinks my blood abides in me, and I in him” (John 6:56). What is so mind-boggling is Aristotelian physics on which the concept of transubstantiation is based has long been disproven, yet the thirteenth century idolatrous dogma is still the centerpiece of the Catholic sacramental system.12 Thus, it is still taught and practiced in every Catholic Church and parish worldwide. “Life in Christ” does not “have its foundation in the Eucharistic banquet.” Neither is “an intimate union with Christ Jesus” any part of the “Eucharist of Holy Communion.” To buttress its argument, however, Rome cites quotations from John 6 as proof texts. The particular verses have been wrenched out of their biblical context, which will not support the Catholic interpretation, and carefully placed within the Catholic Tradition. The effect is to give a superficial but deceptive credence to the humanist reasoning that is the real foundation of Catholic dogma. Since there can be no synthesis between the authority of the Bible and the authority and Catholic Tradition, the Vatican must ignore the true meaning of what the Lord clearly stated in Chapter 6. Earlier in the chapter, the Lord taught that our spiritual desire as believers is not “for the meat which perisheth,” but rather “for that meat which endureth unto everlasting life” (John 6:27). When the Jews asked the Lord, “what shall we do, that we might work the works of God?” (John 6:28), He answered, “This is the work of God, that ye believe on him whom he hath sent” (John 6:29). This answer sets the stage for what was to come. Believing on Him alone whom the Father has sent is central to what Christ Jesus proclaimed, for “There is one Mediator between God and men, the man Christ Jesus.”13 On the authority of the Bible alone, to believe on Christ Jesus alone, by God’s grace alone, through faith alone, is the foundation of life in Christ. Christ Jesus also explained the standard by which His teaching was to be understood. He said, “it is the spirit that quickeneth; the flesh profiteth nothing: the words that I speak unto you, they are spirit, and they are life.”14 His words are to be understood spiritually, and not after a physical and literal manner. He is the true food of the soul by faith, not of the stomach by digestion, which is implicit in Catholic teaching on the Eucharist. The Lord’s teaching is so clear that He equates spiritual thirst with believing on Him, “he that believeth on me shall never thirst” (John 6:35). “And this is the will of him that sent me, that every one which seeth the Son, and believeth on him, may have everlasting life” (John 6:40). The New Testament says nothing about looking to physical signs to have union with Christ. Rather, believers are to look, “unto Jesus the author and finisher of our faith.”16 He is the Author and Finisher of their faith: its beginning and end. Rome’s sacraments look to physical rituals for life. Thus, the sacrament of the Eucharist cannot deliver the “intimate union with Christ Jesus,” which purportedly is its principal fruit. Just as Buddhists look to their votive offerings before a statue Buddha for enlightenment, so also Catholics look to worship before a piece of bread for spiritual life. But Jesus prayed to His Father in the garden for those who are His own through God’s grace alone and who believe on Him alone through faith alone, “Sanctify them through thy truth: Thy word is truth.”17 There can be no compromise of the truth with the traditions and imaginations of men, as the Catholic Church has sought to do. not worship the communion bread. 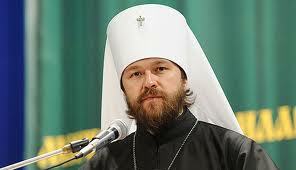 Orthodox Church will preach the homily. Indeed, while Kevin Doran vehemently disapproves of the Pope’s ecumenical agenda, with regards to the Congress, it is clear that Doran believes very strongly in transubstantiation and that there is no salvation outside the Catholic Church. For Doran, it is too much that the Pope would defile something as solemn and treasured as the Eucharistic Congress by allowing these ecumenical intrusions. In fact, the Pope has his own agenda. He has purposely chosen ranking leaders of other churches and important groups for this very Roman Catholic occasion. Pope Benedict understands how such an honor can help soften opposition and smooth over dogmatic differences. The IEC is to be a highly visible public event. How better to demonstrate to the world that other major churches and religious groups are joining with Rome? 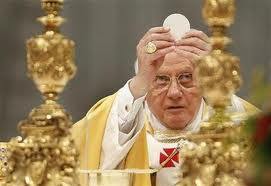 If it were otherwise, how could they be participating in the liturgy of this very Roman Catholic ritual? This showy event provides yet another occasion that can be used to advance the present Catholic-driven narrative that Catholics are Christians. It has ever been the objective of the Papacy to gather power unto itself. If devout but lesser men like Kevin Doran are offended and confused when their own leaders trample their primary beliefs, it means nothing to the Pope. Rather, the primary objective of the Papacy is to gather all Christendom to the Catholic Eucharist.24 Pope Benedict XVI is simply staying true to course. What Hope is there for Religiously Devout Idolaters? Because God’s justice had to be satisfied, the Lord Jesus drank the dregs of the cup of God’s wrath. He said, “The cup which my Father hath given me, shall I not drink it?”25 In the garden of Gethsemane He proclaimed the words, “My soul is exceeding sorrowful unto death: tarry ye here, and watch ... And he said, Abba, Father, all things are possible unto thee; take away this cup from me: nevertheless not what I will, but what thou wilt.”26 The next day, on the cross of Calvary, the Lord Jesus drank all of the cup of God’s wrath. At the height of His suffering, He appealed to His Father, “and at the ninth hour Jesus cried with a loud voice, saying ... my God, my God, why hast thou forsaken me.”27 Thus, the Lord Jesus utterly drank of God’s wrath against sin and finally cried out, “it is finished.”28 Consequently, the tremendous wrath and curse due to believing sinners was paid in full by the Lord Jesus Christ. As the substitute for His believing people, the Lord drank the cup of God’s wrath. Now in the Gospel, the sinless Lord presents to sinners His finished sacrifice. If you are anxious to be right with God, look at what the Scripture proclaims, “But now the righteousness of God without the law is manifested.”29 This means that God has provided another way to be made righteous than through the law, and that is through faith in Jesus Christ alone. The moral perfection of God is imputed to us sinners, but only as we believe in Jesus Christ alone whose own body was sacrificed on Calvary as substitution for us. Indeed, we are all sinners deserving the wrath of God, but the glory and the magnificence of the Gospel is further proclaimed as “being justified freely by His grace through the redemption that is in Christ Jesus.”30 Believing sinners are justified freely by God’s grace through the redemption that is in Christ Jesus. The Lord God of heaven draws sinners to Jesus Christ’s righteousness. No. 9, “Eucharisticum mysterium” in Vatican Council II Documents, Vol. I, Para 3. Bolding not in the original.